Wow. This is the eighth book in the series, but the first I've read. I have been missing out! I was able to enjoy this book, but will definitely read the previous ones! I really enjoyed the setting of South Cove and Coffee, Books and More. The characters are realistic and well written, especially Jill. The whodunit kept me guessing right until the conclusion. I highly recommend this book. I voluntarily read an Advance Reader Copy of this book. Enjoyed it very much. Her characters are growing and changing - that's good. South Cove, California is the home of Jill Gardner. Jill runs a Coffee and Book shop with her aunt. They are hosting the popular mystery writer, Nathan Pike for a book signing event. He will be spending time in town to write his next book plus spend time with Detective Greg King to experience real police work in action for his book writing. 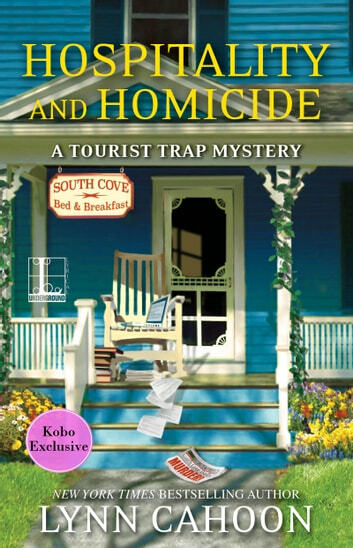 The owner of a local Bed and Breakfast is found murder. He was murdered exactly as a character in the author's draft for his next book. Jill is kept busy studying for her exams, interviewing people for the shop, keeping an eye on her psychic neighbor, deciding whether she and Greg should live together plus investigating the murder to prove the author's innocence. Her psychic neighbor believe a missing boy is alive and is trying to locate him after everyone else gave up on finding him. Emma, Jill's dog plays an active part in helping solve one of the mysteries. The story is fast paced with interesting, colorful and well written characters. It has plenty of suspense, humor and a touch of romance. This is book # 8 in the Tourist Trap Mystery series. It can be read as a stand alone. Good read!! I volunteered to read this eBook. Thanks to Lyrical Underground and Kensington Books via Net Gallery for the opportunity. My opinion is my own. Another enjoyable read with an interesting plot line. Normally I can figure out the perpetrator of the dastardly deed but this time it eluded me. It was not until the end of the story that the killer was identified & I was totally surprised. I love to see how the characters continue to develop and grow. They aren't static or formulaic and neither is the story. The only downside was the typos. The publisher really needs a better proof-reader. Can't wait for the next in the series.